This week’s tutorial is going to be a little different than usual, in part because variety is fun, and in part because I was on vacation most of the last week, and the whole point of vacation is, I feel, somewhat ruined if one spends it worrying about how to get a blog post prepared. Initially, I wasn’t planning on doing any kind of tutorial at all this week – I was just going to ramble at length about projects I’ve been working on but haven’t finished, and projects I’d like to do in the future, and try to insert a few entertaining anecdotes along the way. So really you should consider yourselves lucky that you’re getting this instead. Unless you’re allergic to lemons, in which case this post may be a bit lost on you. Not that I’ve ever met anyone who’s actually allergic to lemons – is that even a thing? I assume it’s a thing, because these days someone somewhere seems to be allergic to anything and everything you can think of, from peanuts and wheat to organic zucchini. Some poor soul out there is probably even allergic to crayons, which is pretty much the most tragic allergy I can think of. Anyway, if you’re allergic to lemons I do apologize, but I promise that next week’s post will have nothing whatsoever to do with any citrus fruit. My boyfriend’s sister once told me that you can grow lovely, leafy houseplants from lemon seeds – just the seeds that come out of the lemons you buy at the grocery store and squeeze onto your organic grain-fed free-run chicken breast. So I started collecting seeds. New decorating plan for the living room! Every time we used a lemon, I’d pull out the seeds and dump them in a little dish. Then when I was ready to plant them I did some belated Google research, and it turns out you’re supposed to plant the seeds as soon as you remove them from the lemon. Make a little cut in one side of the seed (presumably without also cutting your finger, but exactly how you’re supposed to accomplish this when the seeds are so small (and have a tendency to ricochet off the wall and disappear if you try to use a knife on them without having your fingers in the way) is quite beyond me – gardening is apparently way more complicated and dangerous than I’d previously imagined). Make sure it’s special, de-toxified dirt with absolutely nothing added. Make sure it’s dirt with certain special additives. 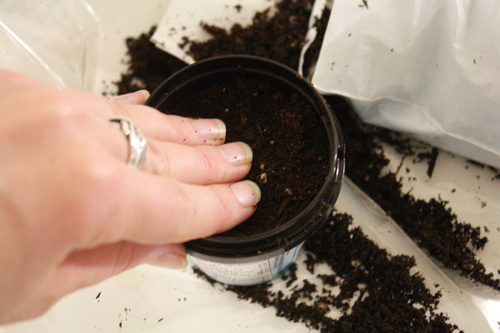 Put the dirt in a paper cup. Put the dirt in a plastic cup. 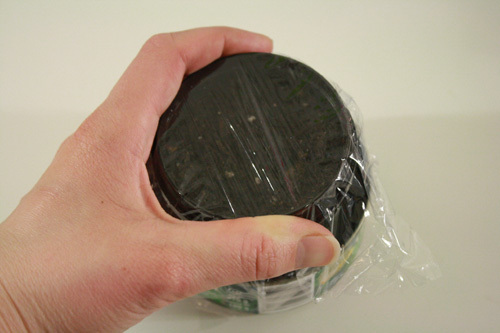 Cover the cup of dirt with plastic wrap. 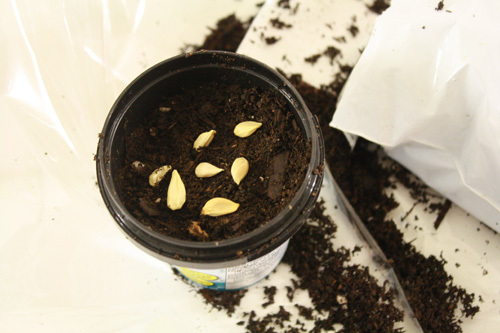 Don’t plant them in dirt at all, rather encase them in a damp paper towel, and leave them in a warm place to germinate. Use exactly the right kind of paper towel. Don’t let them dry out! Sing “An English Country Garden” while spinning slowly in a counterclockwise circle with a length of hemp cord looped around one ear just prior to planting the seeds. The moral of this story? Never look things up on the internet unless you want to be thoroughly confused. Also, gardeners are about as uniform in their opinion of how to do things as crafters are. As in, not at all. In the end, I found such an abundance of information that I decided to ignore the vast majority of it and use my own instincts. Which basically meant shoving them in dirt – same way you “plant” things when you’re two years old and playing in the back yard. Because it works. 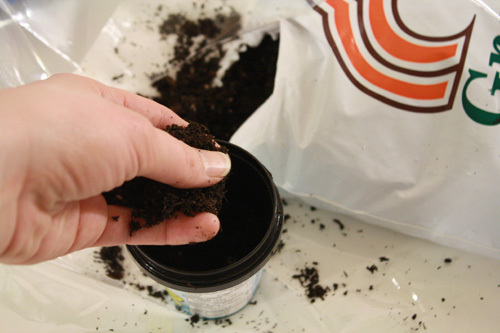 1) I got some dirt (the only kind the store had, and I don’t know exactly what is or isn’t in it, but it’s DIRT). 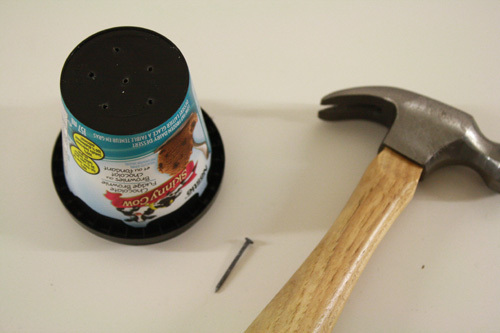 2) I poked some holes in a little plastic ice cream cup using a hammer and nail. I recommend using a little plastic ice cream cup over any other kind of cup, because this way you get to eat ice cream first. 3) I filled the cup not-quite-to-the-top with dirt. 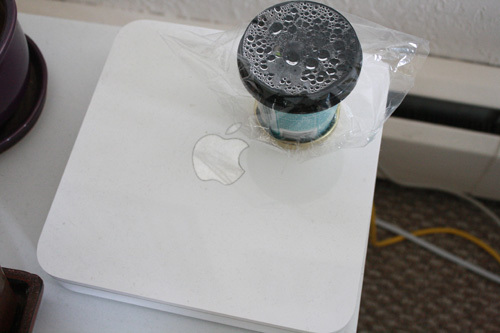 7) and put a piece of plastic wrap on top to keep the moisture in. 8) Then I set it on top of our Apple Time Machine, which stays quite warm and is where we used to keep our fish in his bowl for the same reason. Supposedly meant for automatically backing up your data, the Apple Time Machine also functions as a fairly effective miniature greenhouse. 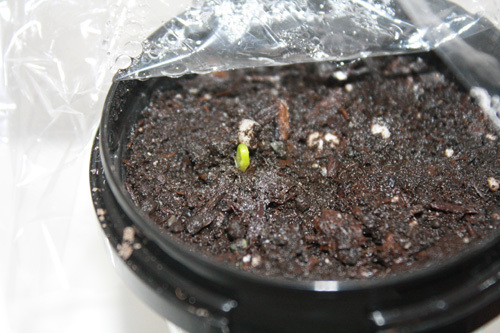 9) last week, I saw a little green sprout! And now I bask in the glory of the fact that I GREW something! Of course, this is Victoria, moisture capital of Canada, so I probably could have dumped the seeds on the living room carpet and they still would have sprouted. Stopping things from growing is the bigger challenge around here. It seems, in the end, that the only seeds that are growing are the new, fresh ones, so that bit of internet advice was probably correct. Kind of makes sense, if you actually stop to think about it. Which, obviously, I didn’t. 10) And then I did absolutely nothing. 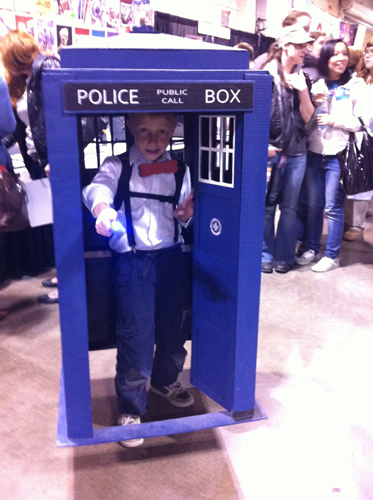 We went away for several days to the Calgary Comic Expo and other adventures (which I will try to do a post about later, because I took many pictures of penguins and people in Tardis costumes – though not all at the same event), and I left the wee sprout to hopefully not die in our absence. 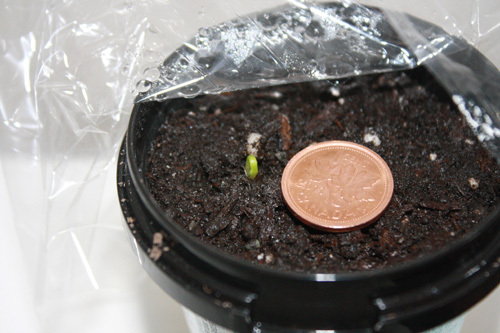 And when we came back, it had grown taller, and there was another wee sprout beside it! This growing stuff is awesome. Makes you feel powerful and Mother Nature-y. I may start putting all our fruit and veg seeds in dirt until we have an entire indoor grocery store garden (as in, grown from stuff we bought at the grocery store). Haven’t mentioned this plan to the boyfriend yet… may need to do that first. Excellent post .. Informative and quite hilarious. And now I’m going to try to grow my own little lemon tree too! 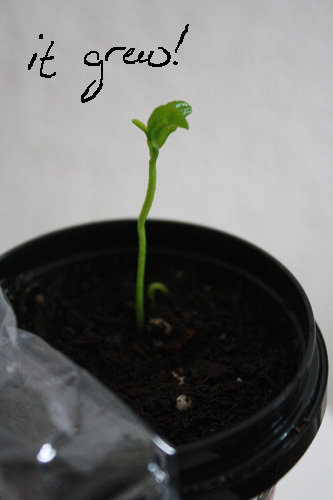 I did this about a year and a half ago… I Did the same thing, just threw the seeds in dirt & watered them. Now I have two scrawny looking “trees” that are about 2 feet tall and smell faintly of lemons. The leaves are fairly big, the largest right now is about 2 inches wide. They have small thorns too. From what I read when I decided to try planting the seeds, they’ll probably never grow fruit, just have the smell and the thorns. 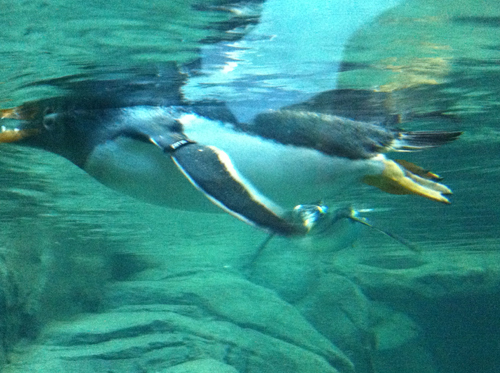 There were supposed to be pics in that last post…. Nice! Yeah, I’m not expecting fruit, but some nice leafy plants like in your photos would be lovely. 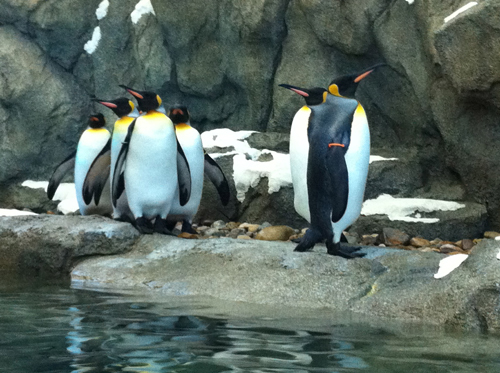 I didn’t realize they’d smell of lemons anyway – bonus! 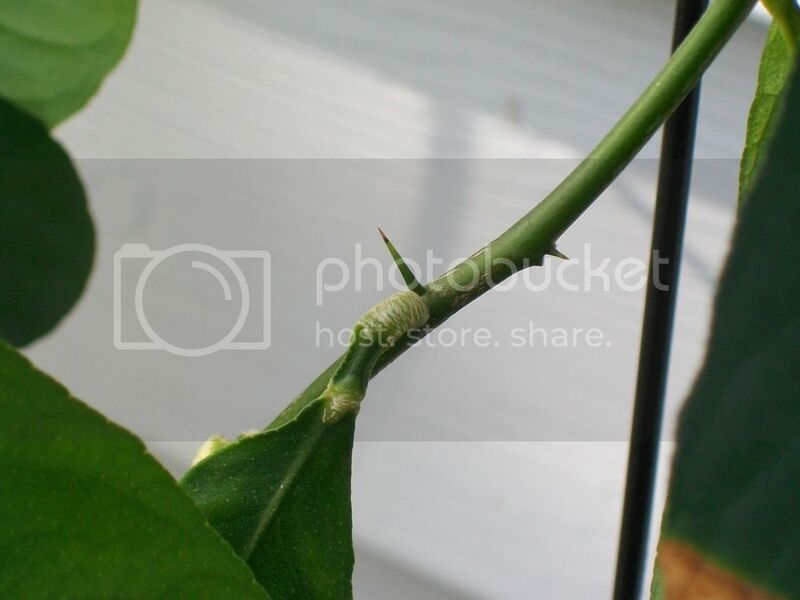 Nor did I know that lemon trees had thorns. Huh. i have a question… are u supposed to water them if yes how much water do they need exacly? Yes, they definitely need water! Not a ton, though. When they’re first planted, I give them enough water to get the soil thoroughly moist, then give them just enough water to keep the soil lightly moist. Once they’ve sprouted, I refrain from watering them until the soil starts to look a little dry (before the soil has cracked though). Make sure they’re in a container with some drainage and that’ll make things easier, even if you over water a bit. Its soooo amaaazinnng ! Cant wait to try it out ! 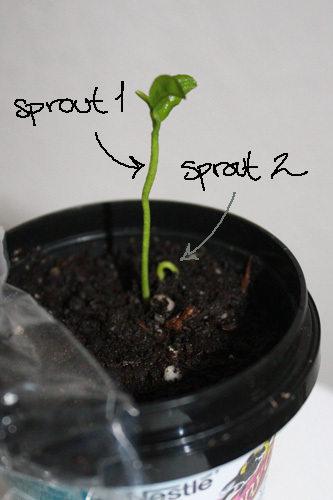 So after the lemon seed sprouted did you remove the plactic wrap? 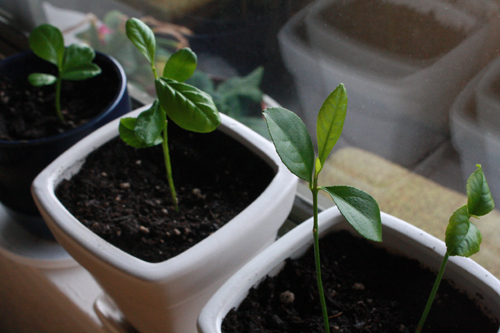 Would be better if you just wrote about growing seeds from lemons instead of junk.